Kinchkard is the quick and simple way to save you money on travel around the Kinchbus universe. Whether you use the bus every now and then or every day of the week we’ll have one to suit your needs. It couldn’t be easier to get hold of - buy on the bus from one of our friendly drivers or just buy on-line using your desktop, mobile or tablet. Once you have your Kinchkard you can reuse it again and again. There are two main ways of topping up your Kinchkard with credit – by trips or by days. Trips – You can load your Kinchkard with 10 trips at a time (up to a maximum of 20 trips). Each time you use your Kinchkard on the bus we will take off one trip. If you aren’t planning to use the bus for a while don’t worry… your trips will still be waiting for you the next time you need them. They don’t expire so buying trips is a great way to travel if you don’t use the bus that often, and it’s cheaper than paying cash! Days – This is where you can save the most. If you buy 28 days you can use the bus as many times as you can before your card expires. 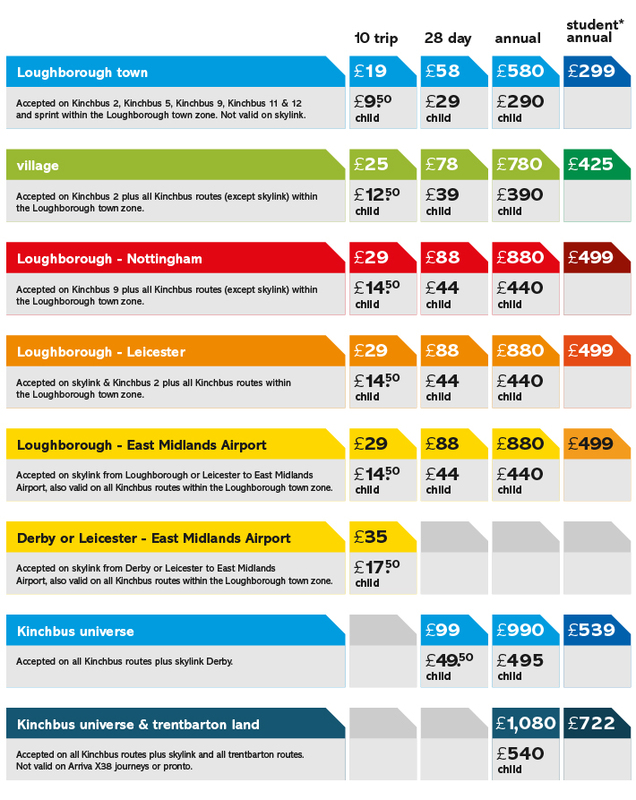 As well as unlimited travel on your chosen route we’ll also give you unlimited travel on any Kinchbus within Loughborough town. *Kinchkard student annuals are based on an academic year, running from 1 September - 31 July. Not sure which Kinchkard you need? Kinchkard is here to save the students of Loughborough. Even the little ones can make big savings with Kinchkard. All of our Kinchkard zones are available for kids aged between 5-15 years old at a 50% discount from the prices shown above.